Scott and I have schedules that mean during the workweek we only cook dinner together about two times a week. This makes it impractical to keep a lot of fresh food in our fridge (cleaning it out got depressing, so many unidentifiable items) so we tend to pick something up to cook earlier in the same day. To make it even easier I’ve been figuring out what half-prepared foods to keep in the freezer. For whatever reason if I made something complete (say lasagna) and freeze it we never seem to actually eat it, we prefer to make something we are craving so having components that will cut down on dirty dishes and chopping time have been making a big difference. It nearly makes me feel like I’m qualified to be an adult. Image by Tara Austen Weaver, Tea and Cookies. Basic technique: two sliced onions in a 10-inch pan, 1/4 cup olive oil, medium high heat, stirring every five minutes and patience. It will take about 30 minutes. For a more detailed description go read the entry at Tea and Cookies and follow her tip about slicing bits a little thicker than others. I let these cool, put them in ziplock bags pressed flat and freeze them. Then I break off a tablespoon or so as I need it. So far we’ve mostly been using them in egg dishes. 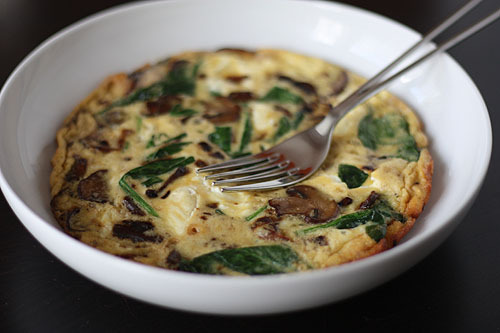 For the omlette pictured above I used mushrooms, spinach and goat cheese left over from a salad with some of the caramelized onions to create a way more delicious breakfast than I usually have. 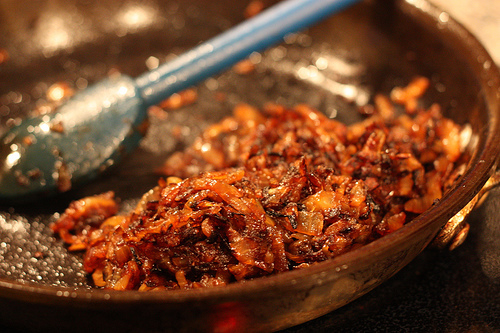 Tara describes caramelized onions as the bacon of the vegetarian world, they are smoky and salty and add a hit of flavor whatever you add it to. And people, yum. Also, having them on hand will make you feel like a genius. I love caramelized onions so much that I struggle not to eat the whole bunch hot out of the pan! Last time I made them I did two large pans so I could sneak a few forkfuls without feeling guilty of eating half the bounty. do you have a slow cooker? i’ve been meaning to try the recipes i see for crockpot caramelized onions (google turns up a lot). they take a while (like 10 hours) but you can do a bunch at the same time. I do this too. They’re great to mix into mashed potatoes also. This is genius! I did a big batch over the weekend! Thanks so much for sharing this idea. Iranians call this piaz dagh (hot onions) and they are fabulous stirred into soups and stews. My father hates the smell of the onions, so my mom makes them outside or when he’s not around. nazila – Your mom is smart! In the summer I’ll make these in our cast iron pan over the grill and avoid getting the house stinky, thanks for mentioning it. I am so looking forward to this series. I am completely dependent on my freezer. My specialties are IQF things like meatballs and raw cookie dough. Carmelized onions are a great addition. Trader Joe’s needs to sell frozen caramelized onions. Let’s all write them letters.